Employee recruitment is considered a very important tactic in growing your business. If fact, Steve Jobs, among many other elite businessmen and women, would agree that hiring is the most important job of any business. Businesses and employers depend on the quality of their employees for profitability and growth. In our latest Chamber Member Intel survey, we asked about employee recruitment issues and best practices. 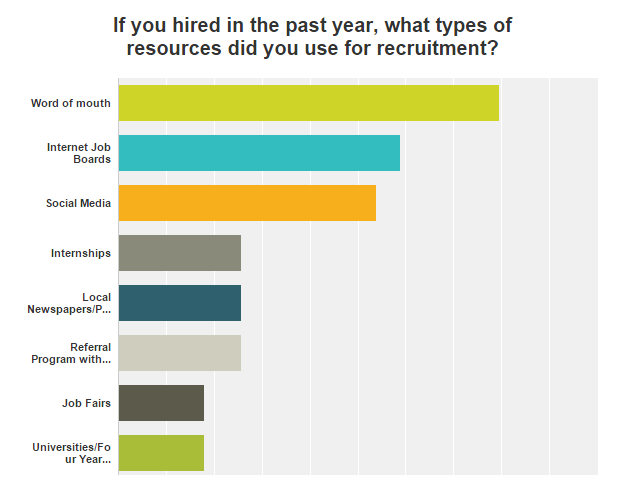 The results of this survey showed that the top three resources for employee recruitment were (in order) word of mouth, internet job boards, and social media. Other methods also noted were local newspapers, internships, referral programs, job fairs, universities and recruitment programs among many others. The most common method employers use to recruit or retain their employees was by offering competitive pay and/or compensation. However, a little over 30% of respondents shared that the average length of time to hire for open positions was between 4-6 months or longer. With so many different resources, methods and a great investment of time, employee recruitment can be difficult. In fact, three out of five respondents shared that their organization had difficulty filling open positions. The Greater Sarasota Chamber of Commerce is dedicated to working with and for you to solve these issues. We are excited to announce that a new benefit to our members is coming soon. The launch of our new job bank will allow members to post their open positions and search resumes posted in the bank by job seekers. Stay tuned for more information about the job bank. In the meantime, check out our business resources.